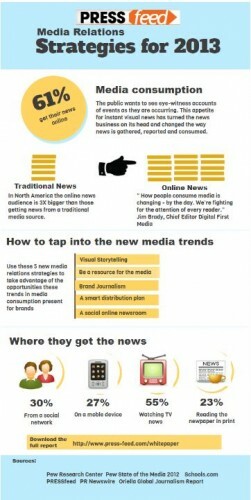 December 3, 2012 /MarketersMedia/ — PRESSfeed, the socially integrated online newsroom, has released a new report that identifies five media trends businesses can use to increase their online visibility and reach new audiences. The days when most people read the newspaper over a cup of coffee every morning and watched the evening news on TV are long gone. Now they expect to see accounts of events, as they are occurring. This appetite for instant visual news has changed the way news is gathered, reported and consumed. While this is not good news for the media, it has opened many new opportunities for businesses and organizations: brands can become a content resource for the media (earned media), publish their own news, (owned media/brand journalism) and buy space for branded content on news and social sites (paid media). • Visual Storytelling - Studies show that adding visuals to a text story increases views and engagement by as much as 9x. • Become a resource for the media - newsrooms are under pressure and are working with limited resources. Offer experts, research and visual material to expand and enhance a story. • Brand journalism - tell your own stories using blogs, mini-sites and industry news sites. • Develop a smart distribution plan - an email to a few journalists and placing your news release on the wire is not enough. Build a network of influencers who will give your content legs. • Host and display all news content in a social online newsroom. Operate the newsroom like a publishing exercise. Make it a venue where creatives, editors and community managers can collaborate, curate and syndicate your news content. The 27-page report covers the five trends in depth and offers ways businesses can use the strategies to increase their online visibility and brand reach.